Good morning, Friends! 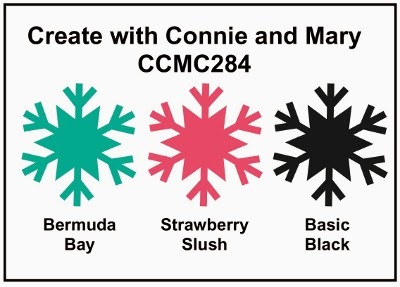 Create with Connie and Mary have a fabulous color challenge for us today! Take a look! See more inspiration from the very talented design team at Create with Connie and Mary! I hope you will play along with us this week! I always look forward to seeing what you create with our challenges! Thanks for stopping by and have a fabulous day! Wrong color or not, it is still a lovely card. Love the panel with the border at the top and the round corners. I haven't used my Cupcake Punch in forever. I like how you added the banner to it like that! If you hadn't said it was the wrong color...I would not have known! Love cupcakes! Great card! I would have never known it was the wrong color! You did a great job with the challenge, crisp and clean layout, perfect with the cupcake. Very cute...like I said, no one would know it wasn't Strawberry Slush. 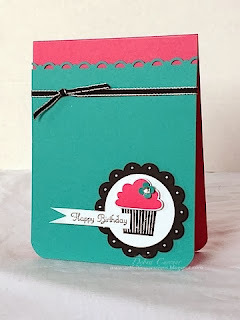 Love the cupcake, a sadly ignored set at my house lately! Great job with the color challenge.